From my living room window I can see a tangled mound of greenery surmounting a wooden fence and gate leading to a communal grassy area. Last autumn, a few weeks after moving in, I began to notice the vine, whose leaves were sporting tigerish stripes. Closer inspection revealed something even lovelier, and truly amazing: the vine was laden with bunches of grapes, sweet and plentiful and ready to be harvested. 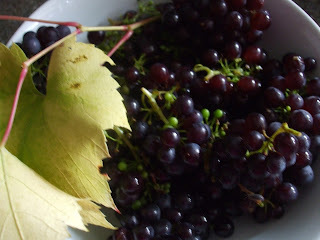 A few enquiries revealed that nobody had been tending it; my neighbour wasn't even aware that it had grapes, and so, in the absence of any other claimants the grapes were all mine, ripe and ready for the picking! As soon as the rain stopped I sprang into action, harvesting as many bunches as possible. I had to leave several: some were out of my reach, others were over-ripe and starting to rot; but even so, within a short time my bucket was overflowing, with more than enough for me and several friends. The other day I inspected the vine and was delighted to see tiny bunches of what look like pink-green seeds: the beginnings of this year's crop, already taking shape and colour. They were no smaller than the ones I had observed in the vineyards above Joigny - so even though we're generally chillier, Oxford's embryonic grapes are currently on a par with those of Burgundy. This is a vine which has never been tended, except by nature, never pruned or given fertiliser or extra water during dry times. It is a vine just doing what comes naturally - producing grapes - to the best of its unaided ability. And whilst careful vine-dressing would undoubtedly improve its health and yield, this little vine, untrammelled and untended, is a reminder that ultimately it is God, the loving vine-dresser of Isaiah 5 and John 15﻿﻿﻿﻿﻿﻿, who tends and cares for everything, and brings all to fruition as a sheer gift, generous and completely unexpected.